I seem to be Single White Female-ing KK and her luscious designs as of late. I am starting to think of Through The Loops as the band whose album you automatically buy, no matter what, on the day it comes out (which apparently explains why I own Lovesexy). All the Water? Got it. Breathe Deep? Downloaded. Joni-Reykjavik-Dr. G's? check check CHECK. 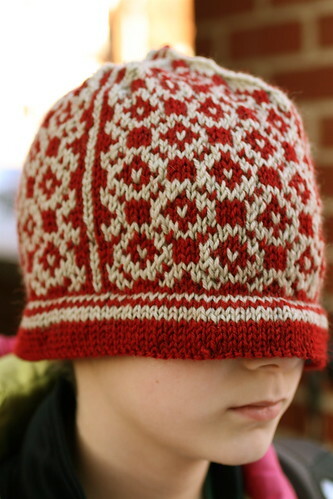 But somehow I missed Confection when it came out, and so stumbling upon it on Ravelry was extra thrilling, kind of like finding the 12" import with an awesome b-side...have I adequately dated myself yet? No matter. Confection is perfection. Needles: Size 6 addi turbo lace needles. Have you tried these yet? Unbelievable. Something about the dull finish and the extreme pointiness of the tips make the whole experience just that more sweet. Mods: Because I went up in needle size I cast on one fewer repeat. 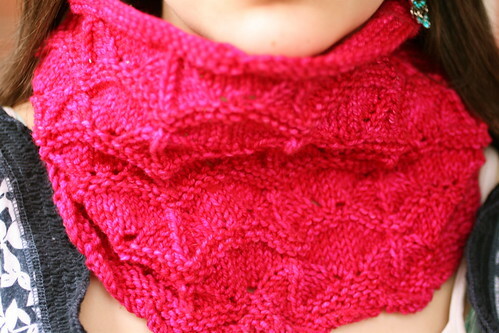 Next up for me is the pattern that's sweeping the nation: Ishbel. Yahaira's sent me over the brink, and after much deliberation and a lot of input from Flickrpeeps, I've cast on using a skein of my girl Wendee's Hazel Knits Euphorbia. I knew it had to be green as I'm hoping to conjur up some spring around these parts! 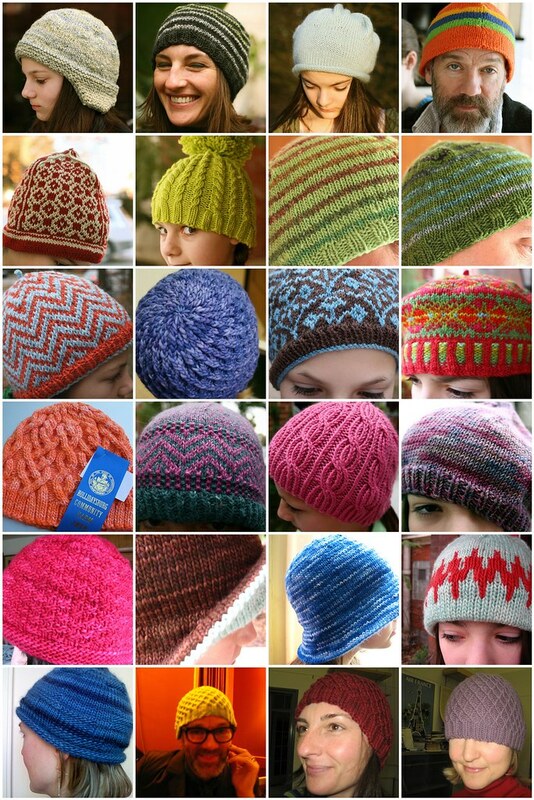 A Year (and some) in hats, and one more. Mods: I did the first 10 odd rows in Magic Loop because I cannot for the life of me get those fiddly dpns to behave on the starting rows. I think that the gauge is slightly too tight and probably should have done the hat on size 9 needles, but I am really happy with this hat. Another TTL winner! 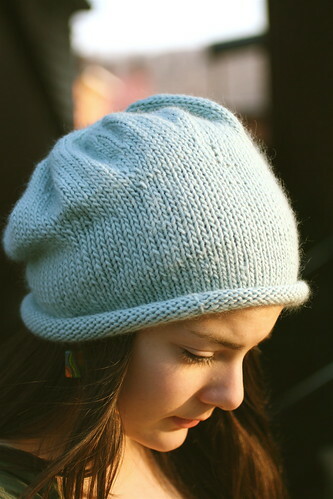 Many of you suggested doing something in garter stitch to highlight the hand spun, and this hat hat does fit the bill. 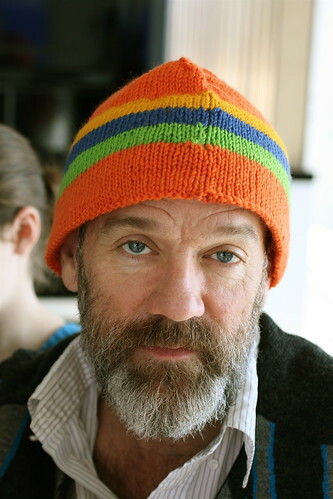 The Curdmudgeon is always asking for a hat that covers his ears, and this hat certainly does just that. I am extra pleased with how this hat turned out because a. my first one was such an epic fail and b. it allowed me to pop in at Stitch Your Art Out and get my pal Cynthia to help me with the half double crochet, because I am crochet impaired. She sat with me and patiently helped me get the hang of it. Once I got home I had this Youtube video open the entire time and that helped as well. 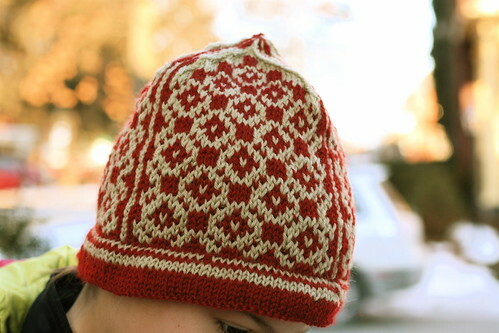 Well I hope to take a break from my hat drill as I am out of enthusiasm as well as ideas. Besides after seeing Coraline all I want to do is make these. Can't Stop. Must. Make. More. The Turn-A-Square continues to occupy my thoughts as it's allowing me to both delve into the recesses of the stash for perennial workhorses like Noro while at the same time exploring new colors like my current obsession, Lamb's Pride Worsted 'Silver Streaks at Nite'. (I'm a sucker for stoopid spelling like 'nite'--guess that 'ght' is not long for this world). Yarn: Noro Yuzen (#1), almost a full skein and Lamb's Pride Worsted 'Silver Streaks at Nite', a half a skein. The Yuzen is a new one for me, and it's a winner. Although the gauge isn't a perfect match with the Lamb's Pride, the two together worked out fine . Babs has declared Lamb's Pride to be the most undervalued yarn around, and I must say that I agree. Thanks for the walk down memory lane with all of your 70s reminiscences--just seeing the word 'Shasta' again was a pure delight. 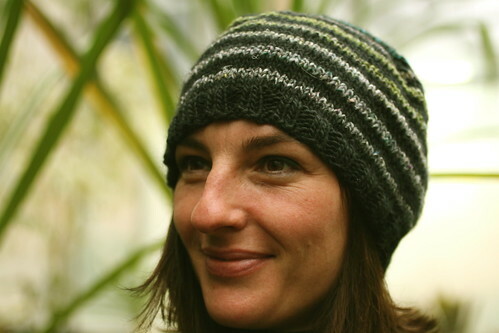 Sometimes I question how sentient I really am when I do things like see a hat on Flickr, obsess over how amazing it is, rush off to Ravelry to queue it only to find out that Oops! I've already queued that one, and recently, too! Isn't aging and the deterioration of one's mind fabulous? I suppose making Alzheimer's jokes really isn't funny for obvious reasons...Let's chalk such moments up to mucho Mary Jane in the 1980s and not contemplate other far less appealing genetic explanations, ok? Mods: I cast on 90 sts and went from there. 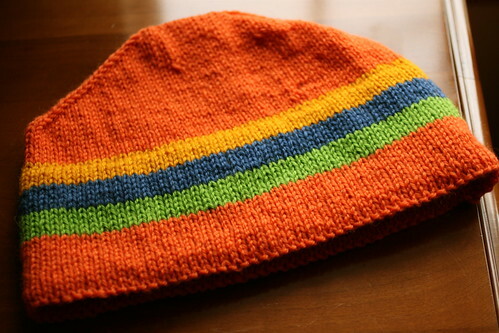 I also made a poofier top by doing an extra set of increases, but I like the Jiffy-Pop shape of it and feel that it's a hat that might be worthy of everyone's fave knockaround pal, Strawberry Shortcake. 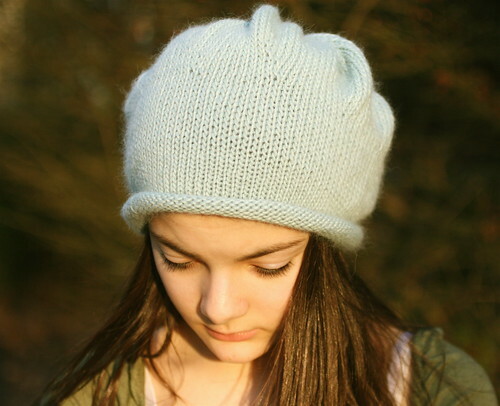 The shape of this hat it was sets it apart from the others--it is so versatile. It seems modern and yet there is a touch of whimsy in there as well. 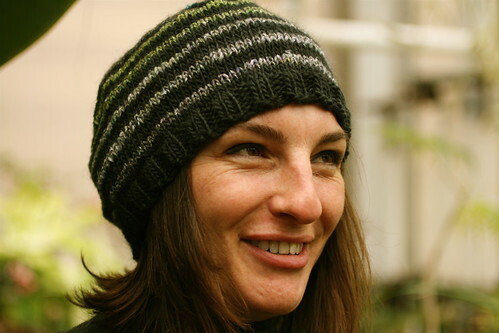 If you're looking for some stockinette therapy, this is your next hat pattern--just make sure to choose a yarn that will flop around a bit. I guess you could say I'm on a major roll with the whole hat thing. 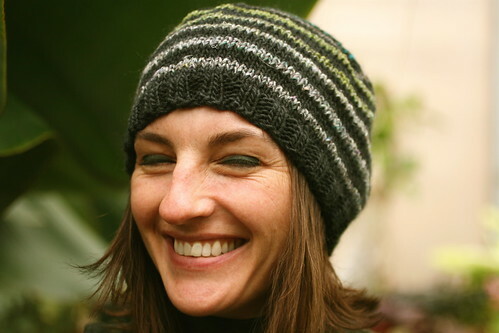 I figure I've got the rest of the year to fuss over socks, sweaters and shawls--right now I am 100% hat centric and am loving it. And after Felicity I have even more in the pipeline! - and voilà, I am in business. Yarn: Brown Sheep Nature Spun Worsted in "Goldenrod", "Orange You Glad", "Nordic Blue" and "Spring Break"; Classic Elite Wings #2385 for the lining. This might be the first time I've made a hat for two people to share. One of the recipients (class of '78) loves the color orange so I wasn't worried that it would be too loud--and luckily they are both amenable to the sharing concept. I'm doing this type of 'two birds with one stone' knitting more often! The Manos Silky Blend you see pictured above represents another first--it might be the first time I have purchased yarn out of sheer humiliation. While in NY, me and my large purse and even larger rear end paid a little visit to the Point. You might know this very cramped store with huge tables that take up almost all of the space in the joint from the Spiders fame? In any case, there is not a lot of breathing room in there. So as I was fondling the Manos display I made a misstep, turned around and my purse swung around and sent a gigantic display basket filled with loud, clattering hangers off a ledge and down a staircase. "Hi! Don't mine me, I'm just visiting from out of town!!". Yes--there were disapproving glares and looks of incomprehension and mild disdain. Covered in shame, you see, I had to purchase the yarn in my hands at that point--it was my only option. Ufserud : Norwegian for 'to buy more yarn'. 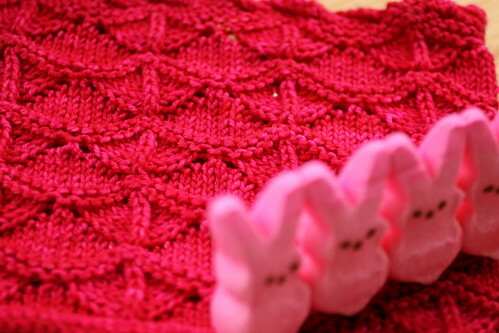 My quest to continue knitting from the stash has taken two steps forward and one step back. 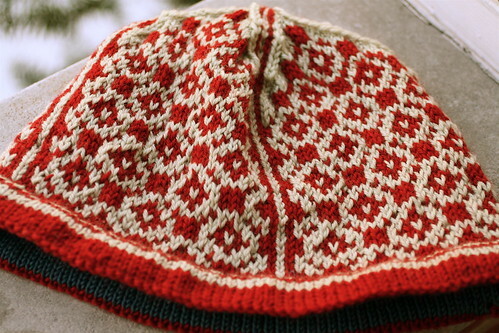 The two steps forward part is Ufserud, a Bea Ellis hat kit that I purchased last year during a fit of flickr envy and have just completed. When I ordered the kit I requested a bold red and a very white white. Upon inspection the colors just seemed way too bright, almost Bicentennialesque, and I suddenly became concerned that my hat was going to be utterly goy-tastic. So I put the kit away on the third floor and went about my usual monkey business. Then during the winter break and my visit to Minneapolis I came upon the full line of Dale of Norway Heilo at the Yarnery and it dawned on me that tweaking the colors ever so slightly (read: buying more yarn) would rectify the situation--so I switched in an oatmeal (#9331) for that brite white (#17) and the game was on. Mods: There were a few. 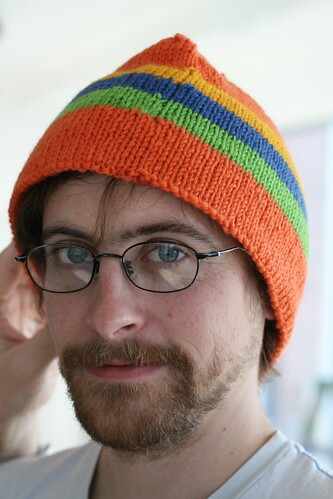 I omitted one repeat after reading about the tendency of this pattern to go gigantic--and even with this modification this hat is big (which I don't mind). I also did a few more decrease rounds at the crown for a tighter join. And rather than sewing the lining in I did the old provisional cast-on and knit the lining together with the working yarn after a few inches. In addition to the new Heilo mentioned above, I also recently had the good fortune to obtain a super luscious skein of the much coveted Pigeonroof Studios handspun heavy worsted merino in 'Pea Soup'. I had no idea a. how unbelievably appealing this stuff was and b. how impossible it is to get your hands on it. 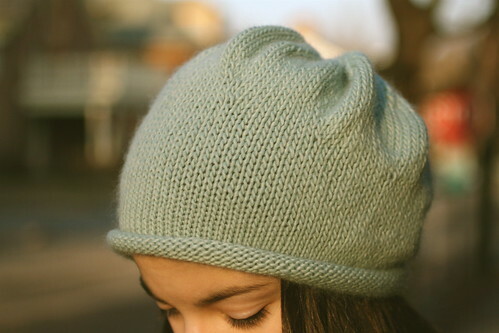 I stumbled upon the Etsy site and there was this one skein left--my survivor/self-preservation instincts kicked in (?) and I selfishly nabbed it. Just in time for Handspun February! I have 145 yds. of this--any ideas?